Richard Anderson, a longtime TV and film veteran whose career stretches back to the 1950s, has died. The New York Times reports that the actor was at his home in Beverly Hills. He was 91. Fans of 1970s television are likely the most familiar with Anderson, as he portrayed Oscar Goldman, the man behind The Six Million Dollar Man, the 1974-78 series in which Lee Majors portrayed astronaut Steve Austin, who becomes the world’s first cyborg after a tragic accident. Anderson transferred that role to the hit series’ popular spin-off, The Bionic Woman in 1976. When that show moved to NBC from ABC, Anderson became the first actor to play the same role on two shows on separate networks. Anderson’s easily adaptable, conservative style made him a fit for many authority figures and military types. He started out in a variety of movies, notably as an officer in Leslie Nielsen’s crew in 1956’s Forbidden Planet, the object of Joanne Woodward’s affection in 1958’s The Long, Hot Summer (until Paul Newman shows up), and hanging out with Ann-Margret in 1964’s Kitten With A Whip. But once Anderson moved to the small screen, he never looked back, as he was able to play a variety of roles on popular early shows like Gunsmoke, Big Valley, and Ironside; a cop on Perry Mason; and The Fugitive’s brother-in-law. After a series of guest-starring roles in the early ’70s on Hawaii Five-O and The Streets Of San Francisco, Anderson finally struck paydirt with the mega-hit The Six Million Dollar Man, after Darren McGavin stepped out of the role of Oscar after the first Six Million TV movie. 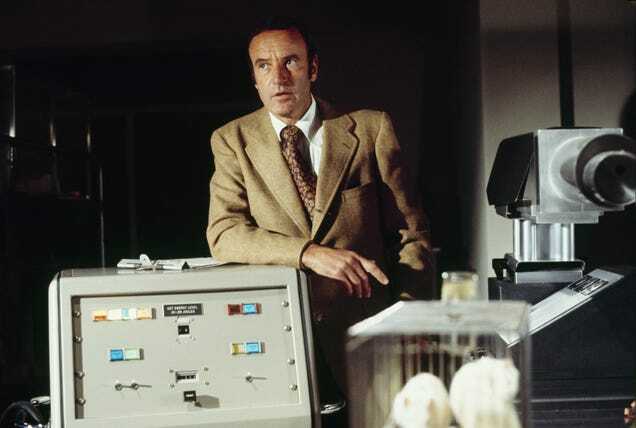 Anderson’s Oscar Goldman was the brains of the OSI outfit, leading the rebuilt Steve Austin into a variety of adventures, and even into a romance with Jaime Somers, the Bionic Woman. Anderson liked his Goldman role so much, he even produced a few later bionic-themed TV movies: Bionic Showdown: The Six Million Dollar Man And The Bionic Woman in 1989 and 1994’s Bionic Ever After? His series success then led to even more guest parts on 1970s staples like The Love Boat and Fantasy Island. As the ’80s progressed, he had a two-episode arc on Knight Rider, and a role on popular nighttime soap Dynasty. Anderson’s last significant role was as the narrator of Kung Fu: The Legend Continues in the ’90s. His success in this voiceover is not surprising, as Anderson’s voice was also responsible for possibly his greatest impact on pop culture: He is the man saying, “Gentlemen, we can rebuild him; we have the technology” at the beginning of the now-iconic Six Million Dollar Man intro.